The Nalu Hybrid paddle boards are the best compromise when choosing the best features between a SUP and a kayak. This particular kayak-looking vessel allows you to stand. This one change in design allows for more versatility when hitting the lake or steady ocean currents. The Nalu features a molded-in seating area with textured, padded foot wells. This unique design allows the paddler to stand and sit at their pleasure. When getting in and taking off, it’s going to be faster since it incorporates the standing position that a SUP offers. For longer treks or if it gets very windy, you have the comfortable option to sit and cruise. The hybrid paddle board is not too stiff or too flexible. It’s made with abrasion-resistant HDPE plastic for indestructible durability against any terrain you come across on the lake, ocean, or rivers. Those oyster beds, shallow and rocky rivers, and reefs won’t cause any damage that will render your Nalu unrepairable. Its surf board-style bow allows for lots of speed and cruising comfort. If you’re a newbie to the water sport, the Nalu is very stable. You can express your joy by jumping up and down on the hybrid without capsizing, even if you don’t have a trace of core balance coordination in you. With the 11 foot Nalu, you’ll have a great ol’ time goofing off for a day of fun. To put those long distances within reach, the longer 12′ 5″ board will get you there faster. The Nalu Series of hybrid paddle boards are best suited for slow rivers, lake and ocean touring, and as a recreational SUP. While many pros would opt for something quite different based on hull style and various other factors, this is an excellent hybrid for beginners and intermediate paddlers. 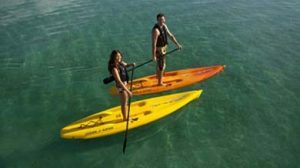 The whole family can use and enjoy this paddle board kayak. If you just want a regular board you can see the full range right here. Buyers from all over the nation love the Nalu series. If you’re skeptical about its performance as either a kayak or a SUP, you’d mirror the concerns of many other shoppers. 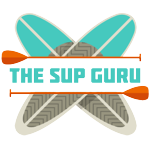 However, buyers confirm that it’s a great board for most activities as a SUP and a YAK! But, you should know that it doesn’t come with a kayak seat (with a back), and it doesn’t come with a paddle. You’ll have to put aside extra cash to purchase these necessities. The Nalu has provided loads of enjoyment for many buyers. There’s tons of storage, especially with the bow hatch that incorporates a quick release buckle for fast and easy access. While this is a one-man hybrid vessel (thumbs down), the weight limits are extraordinary! That extra 10, 20, or even 50 pounds won’t mean a thing for you. Don’t you love that? No Nalu will judge your curvy physique! What is the Bow Hatch on the Nalu Hybrid? This is a gasket compartment on the bow of the board. It can be completely sealed off to keep your keys, phones, etc dry. The low anchor points of the four straps keep even pressure with a quick release belt for immediate access. Is the Bow Hatch on all the Nalu Boards in the Series? All the 12′ 5″ Nalus have the bow hatch system. However, the 11′ boards don’t have the bow hatch. Are there any Accessories that come with the Ocean Kayak Nalu? Unfortunately, what you see is what you get. The hybrid paddle board is the only item you’ll receive upon purchase. However, you will get the bungee for storage on the stern and everything installed for a complete bow hatch with the quick release system. What are the extra Necessities to buy to get Paddling Today? You’ll definitely need to purchase a paddle. Typically, you’ll need a double-blade oar for this style craft, but you can get away with using a SUP paddle if you don’t plan on sitting down too much or taking longer treks. You might also want to consider a kayak seat with a back for ultimate comfort while touring. Are the fins on the Ocean Kayak Nalu Paddle Board Removable? No. They’re molded into the craft. There are three fins on the underside of the board. How much do the Nalu Boards Weigh? The 11′ boards all weigh 44 pounds. The 12′ 5″ boards weigh 50 pounds. Is it a 12′ 5″ board or a 12′ 6″ board? While that one inch difference might not be a huge discrepancy for most shoppers, for the sake of clarity, we’ll answer this question. According to the math, it’s a 12′ 5″ board. Marketing techniques may vary between the 12′ 5″ and 12′ 6″ numbers for the sake of rounding up or to suit their advertising. What are the Max Capacities for the Hybrid Paddle Boards? The 11′ Nalu has a weight limit of 225-275 pounds. This is usually versatile enough and ideal for most families. If you want more poundage, the 12′ 5″ Nalu goes up to 300-350 pounds. If you want everything in a SUP kayak hybrid, the Imagine Surf V2 Wizard Angler SUP Stand Up Fishing Paddle Board is a dream come true. It has a flip-up style kayak seat that can be strapped down when not in use. It even has accessory mounts to make fishing and SUPping more convenient. As you can tell, it’s name is completely designed to attract the fisher. You might find that you won’t have to borrow a buddy’s boat or risk losing your catch while on a SUP. The Imagine Surf hybrid is worth the cost if fishing and paddling is the name of the game! The Burke 10.5 ft. Stand up Paddle-Kayak Board is cheaper than both the Wizard Angler and the Nalu! It closely resembles a SUP, but it incorporates a blend of both SUP and kayak features. While it looks like a solid SUP, it comes with a detachable foam seat, a paddle converter kit, and padded foot wells. If you want to make the most of your dollar, the Scott Burke paddle-kayak board package is your money saver. To SUP (sum) it up, the Ocean Kayak Nalu Hybrid is the epitome of versatility. It performs excellently as a kayak and a SUP. The Nalu is the perfect example of combining both worlds to maximize a paddler’s enjoyment. Will that enjoyment be yours?